For Luke, God’s reconciling love is the core of Jesus’ teaching. Indeed, St. Luke’s Gospel is called the Gospel of Mercy. 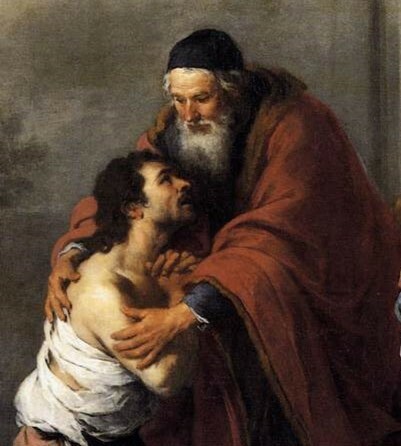 Today’s Gospel features the most beautiful story in the Scriptures: The Prodigal Son. After the son takes his portion of his father’s inheritance, he goes off to a far away place and squanders all his money. Coming to his senses, he returns to his father in order to ask if he could work as a hired hand. However, when he returns home, the Father not only welcomes him back but throws an expensive party. To the world, this seems crazy! Anyone else who acted like that would be considered crazy, at best a soft touch and at worst an old fool. We are to learn from this parable that when it comes to mercy and compassion, God spares no expense. As the father in the parable says: “We had to celebrate. This son of mine was lost and has been found, he was dead and has come back to life.” You are invited to take part in our continuing Lenten devotions: Taize Prayer on Wednesday evenings, Soup and Study on Thursday evenings and the Stations of the Cross on Friday evenings. Please see the bulletin for more details. Let’s do something beautiful for Lent. On Monday, April 8th, St. Luke Productions will present “Faustina: Messenger of Divine Mercy.” This multimedia play will beautifully tell the story of St. Faustina who was canonized by St. John Paul II. Many Catholics have a special devotion to the Divine Mercy spirituality and God’s mercy certainly is greatly celebrated during this Lenten Season. The show will take place in Serra Center. Please purchase your tickets early as I am sure it will sell out. On Tuesday, April 2nd, of this week, we will celebrate our Communal Reconciliation Service. The best way for us to prepare for Easter is to receive this sacrament which proclaims God’s healing mercy. There will be two liturgies at 1:00 p.m. and 6:30 p.m. in Serra center. As we mentioned at the beginning of Lent, Operation Rice Bowl was going to be our community almsgiving project for the parish. Please bring your rice bowls to church next Sunday for a special offertory procession. Catholic Relief Services provides necessary food, shelter, clothing and education worldwide. Also, whenever there is a disaster somewhere in the globe, CRS is there to assist with all things necessary. Please be generous. Thank you! Please continue to remember our Elect in your prayers as they move toward the Easter sacraments at the Easter Vigil.